Chittorgarh Fort, also known as Chittaur Fort, is credited as one of the largest forts of India. The fort is located on a high hill near the Gambheri River in Chittorgarh and lies at a distance of 112 km from the city of Udaipur in Rajasthan, India and undoubtedly can be called as “Pride of Rajasthan”. This huge fort covers an area of 700 acres, extending to 3 km in length and 13 km in peripheral length. There are numerous palaces and towers inside the fort that are worth to be visited. The Fort comprises of several temples including Sammidheshwara Temple, Jain Temple, Kalika Mata temple, Neelkanth Mahadev Temple, Meerabai Temple and Kumbha Shyam Temple and all these are the ancient temples well known for their carvings and intricate work. If it is a Fort , then it must be having an origin too. Yes, this impregnable fort witnessed three battles and every time it was saved by the brave and valiant Rajput warriors. The history of Chittorgarh depicts the saga of valor and courage. As earlier said, the Fort was sacked three times. According to the legend the Bhim, a Pandav hero of mythological epic Mahabharata, was the one who began the construction of the construction of the Chittorgarh Fort, Rajasthan, India. Earlier Chittorgarh was known as Chitrakut, after a local Rajput chieftain named Chitrang. It remained the capital of the local Sisodia clan of Rajputs from the eighth to the 16th century. The history of this town is written in blood and sacrifice. Muslim rulers sacked it three times in the medieval period. Standing on a rocky plateau on a 500 feet high hill, the 700-acre fort went through three sieges, and each time Chittor turned out the loser. But that did not mean that the Chittorgarh Fort was inferior to any other in Rajasthan. It was just that the Rajputs had a habit of riding out to meet the enemy outside the safety of their walls instead of allowing the enemy to launch the first assault. The first was by Ala-ud-din Khilji, the Sultan of Delhi in 1303. Khilji laid siege of this hill fort to capture the beautiful Padmini, the queen of Chittorgarh. When the situation worsened, Bhim Singh, the ruler of Chittorgarh, led his men donned with saffron robes of sacrifice, and rode out of the fort to certain death. 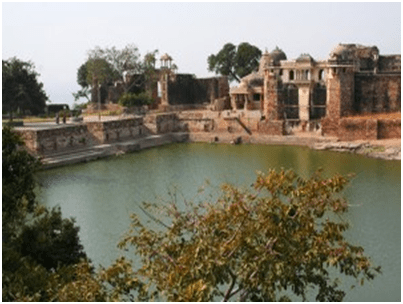 Inside the Chittorgarh Fort, women, including Padmini and the children, committed mass suicide or jauhar (Self-immolation in the fire) rather than losing their honor at the hands of the enemy. In the middle of the 15th century, Chittorgarh gained eminence when the legendary Rajput ruler, Rana Kumbha, ruled it. He built the Vijay Stambh (Victory Tower) to commemorate his victory over Mahmud Khilji, the ruler of Malwa, in 1440. Chittorgarh was sacked again in 1535 by Bahadur Shah, the Sultan of Gujarat. The jauhar that followed the siege saw the death of 13,000 women and 32,000 Rajput soldiers led by Rani Karnawati. In 1568, Mughal Emperor Akbar razed the Chittorgarh Fort to the rubble and once again the history repeated itself. Jaimal and Kalla, two Rajput generals, courageously defended the Chittorgarh Fort. Akbar carried away all the distinctive pieces of architecture and sculpture and placed them in his capital. These are still manifested in the fort of Agra. However, Maharana Udai Singh II, the ruler of Chittorgarh, fled to Udaipur and re-established his rule. The Mughal emperor Jahangir returned Chittorgarh to its rulers in 1616, but it was not resettled. This fort once had 84 water bodies which could provide 50,000 soldiers with water supply for 4 years out of which only 22 remains till now. Entrance to this gigantic fort is marked by seven gates, which are named Bhairon Pol, Lakshman Pol, Padan Pol, Hanuman Pol, Jorla Pol, Ganesh Pol and the formidable final gate named Ram Pol. Two major attractions inside Chittorgarh fort include the towers known as the ‘Kirti Stambh‘ (Tower of Fame) and the ‘Vijay Stambh’ (Tower of Victory). The fort and the city of Chittorgarh mark the celebration of biggest Rajput festival called the “Jauhar Mela” ( February – March)which takes place every year on the anniversary of Rani Padmini’s jauhar. Teej is one of the major festivals in Chittorgarh which is celebrated with great enthusiasm and in the month of July or August. Apart from these there are many other facts about this fort which can only be discovered when visited, so go on and do share your experience with us.